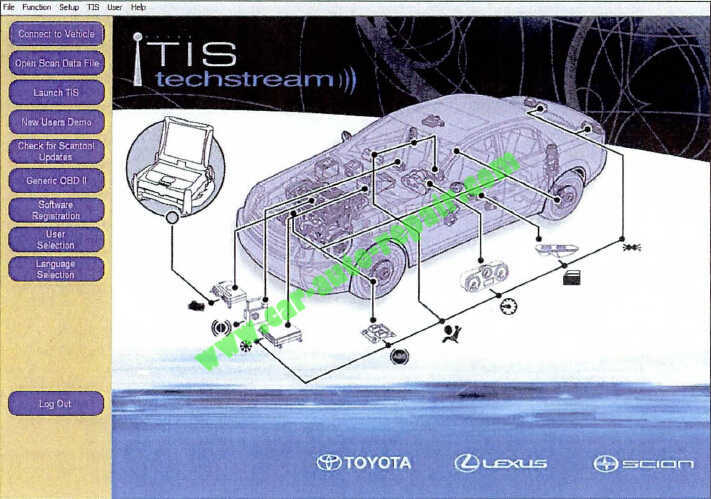 This article show a guide on how to perform all keys lost programming for Toyota via Toyota TIS Techstream. The Immobilizer and Smart Key Reset is a feature that allows the registration of new keys when all master keys are lost. Once the system is reset, all previously registered keys will be erased . 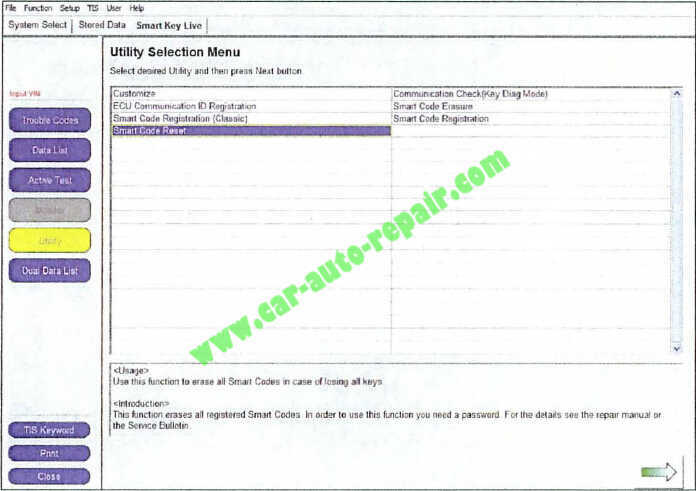 Follow the procedures in this bulletin to reset a vehicle Immobilizer or Smart Key system. There are new security provisions required to obtain a Reset Pass-Code. 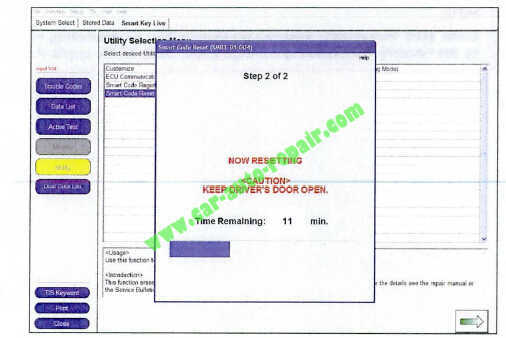 It is critical that the instructions for this new process are reviewed BEFORE attempting to get a Pass-Code in the new system. And the guide use the TIS Techstream Software version 9.10.037 or later is required. 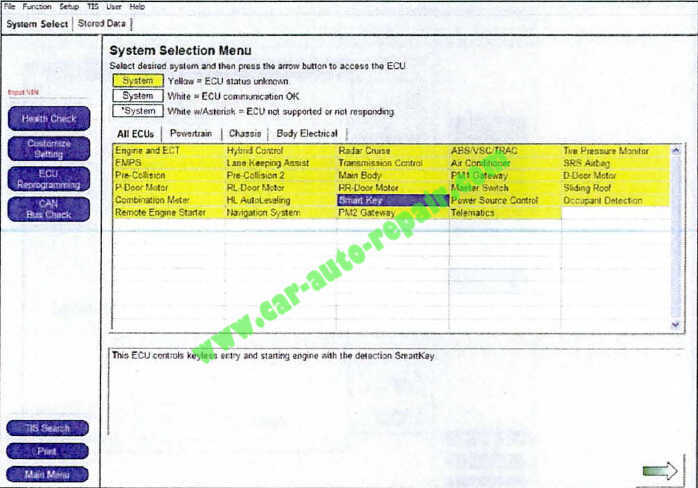 1.Review the vehicle application chart in the Technical Information System (TIS) to verify the vehicle is capable of being reset. 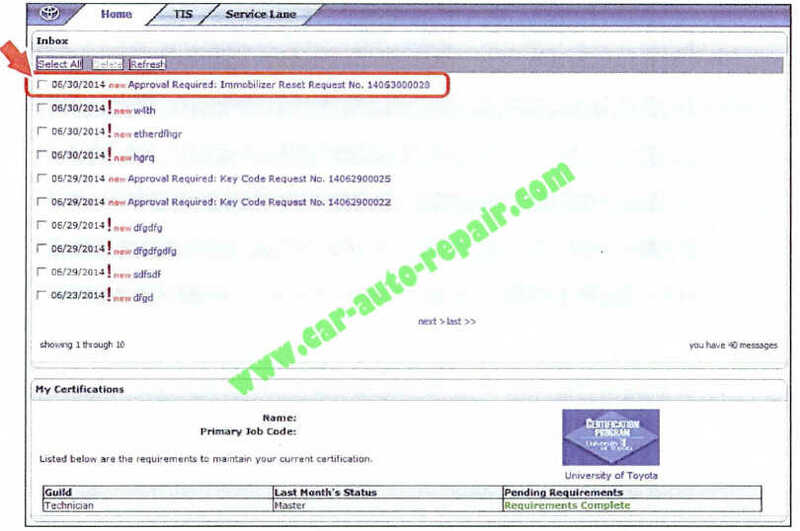 Refer to the Toyota I Scion Vehicle Support chart located on TIS, under Diagnostics -Immobilizer Reset – Reference Documents. 2.Review the new security authorization process and chose the option that best supports your dealer situation. 3.Follow the Techstream and TIS screenshots to obtain the Pass-Code needed to open registration for Immobilizer and Smart Key programming. Some early ECM based Immobilizers cannot be reset using Techstream. 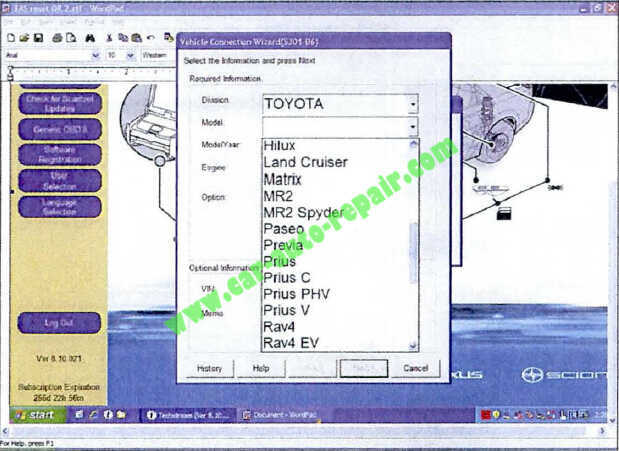 For these vehicles, do the following: Identify the vehicle using the Toyota I Scion Vehicle Support noted above. Refer to the most recent PANT bulletin for instructions. 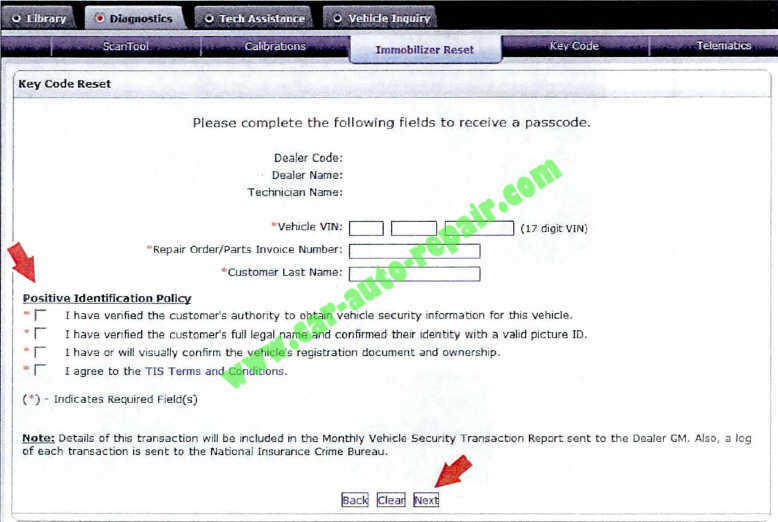 An improved security measure has been implemented in TIS that requires a secondary approval by dealer management each time an Immobilizer or Smart Key Reset request is submitted. Please review the following flow chart and become familiar with the options outlined prior to attempting a vehicle reset. 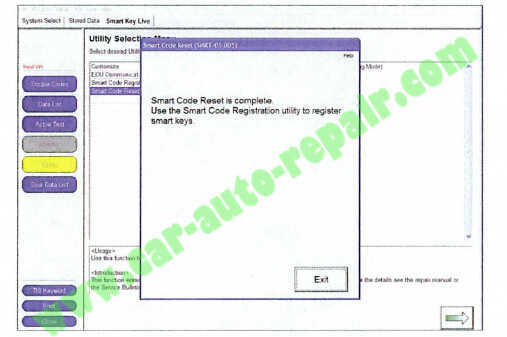 The Reset request can be submitted from the Techstream in the vehicle, or on TIS before the vehicle is available.A single management approval can be used multiple times for the same VIN as needed until the vehicle repair is completed.Each Reset attempt for the same VIN will generate a new Seed Number and a unique Pass-Code.The request and approval hand-off between technician and management is done on the TIS home page inbox accessed at each individual’s location (Techstream, office, etc.). Once the Pass-Code Request form has been completed an approval request will be sent to all approving managers. Dealership personnel with the following job titles in “Staffmaster” are granted Pass-Code approval capability. Dealer Principal, General Manager, Service Manager, Service Director, Service/Parts Director, Parts Manager, Parts Director, Customer Relations Manager, Customer Satisfaction Manager, Shop Foreman,Diagnostic Specialist, Team Leader Each dealer must have at least 2 enrolled managers in order to accessany Pass-Codes. 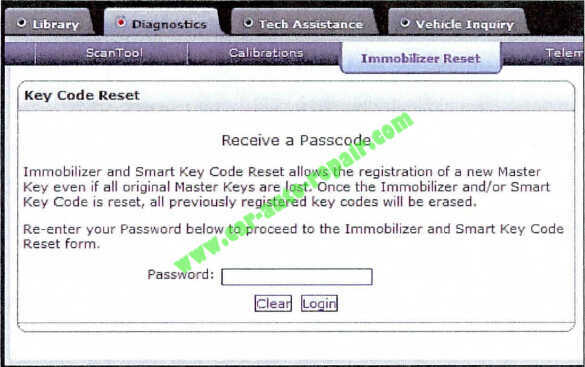 Once a Reset is completed, it may be necessary to enter an “Immobilizer Key Registration” or a “Smart Key Code Registration” utility to program the new keys. Early Immobilizer systems may be ready to accept keys immediately after the Reset if the security light flashes a 2-digit code (such as 21 or 22). Refer to the applicable Repair Manual for details. 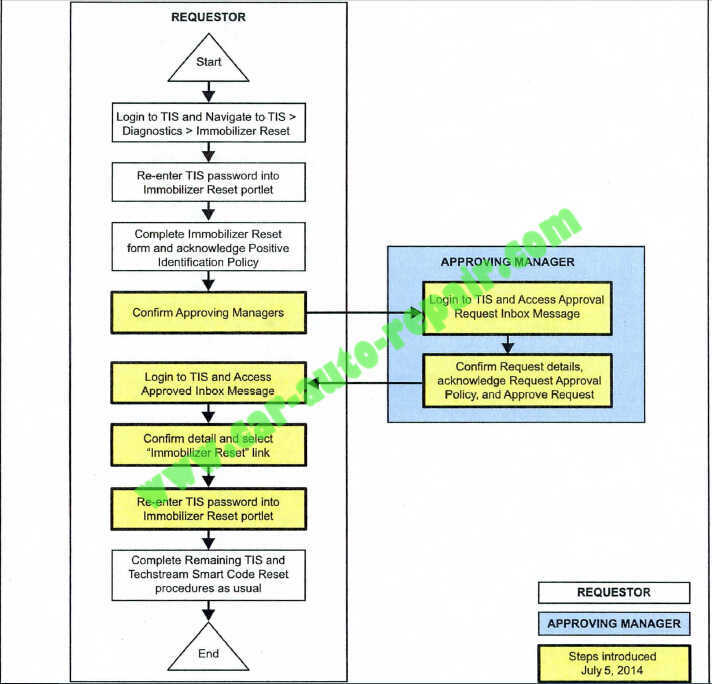 Please review the Techstream and TIS screenshots in this bulletin to become familiar with the new management authorization process flow. 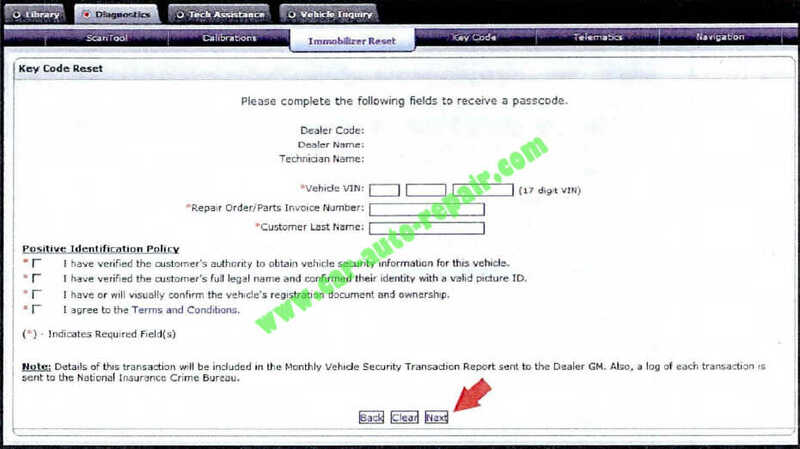 1.Open TIS and enter the Diagnostics and Immobilizer Reset tabs. Login using your password. 2.Enter the information requested , check all 4 boxes below Positive Identification Policy, then click Next. 1.Connect Techstream to the vehicle. information does not automatically populate. 3.Choose the Immobilizer or Smart Key system as needed. 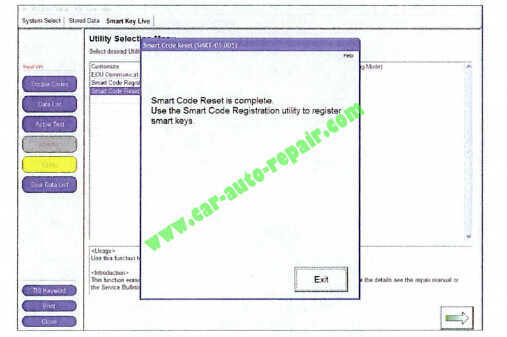 4.Choose the Immobilizer or Smart Code Reset utility. 5.Enter the VIN if prompted. 6.Techstream will generate a Seed Number. Click Get Pass-Code. 7.Click Send to connect to TIS. If there is already a management approval file for this VIN, DO NOT follow the next 3 steps to resubmit a request. 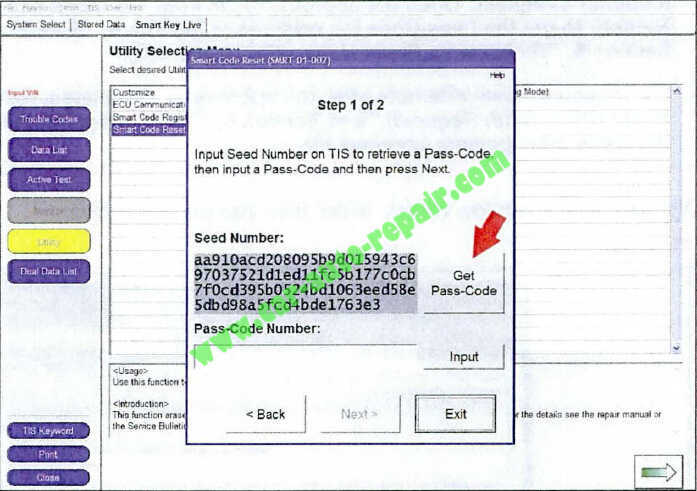 Open the approval file in your TIS inbox and enter the most recent Seed Number to get the Pass-Code (as outlined in Section 5, “Receipt of Pass-Code’). Then go to Section 6, ” Techstream Reset Utility (Reset Initiated).”For repeated Reset attempts after the approval is completed, follow Sect ion 3, ” Techstream Reset Utility (With Request),” and Section 6, ” Techstream Reset Utility (Reset Initiated),” using the same management approval file. 8.When the TIS window opens, enter your password to login. 9.Fill in the required information and select Next. 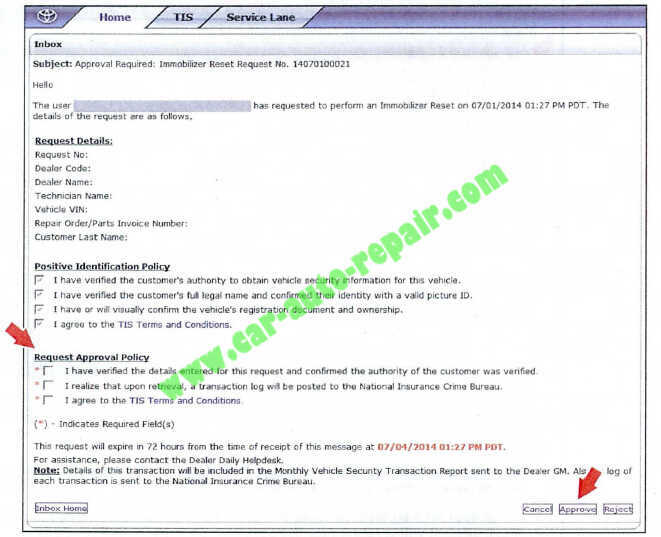 1.Once the request has been submitted, one of the authorized dealer managers will locate the technician ‘s request in their TIS home page inbox.The manager clicks the title to open the Request. 2.The manager checks the 3 boxes under Request Approval Policy, then selects Approve to send the approval to the technician. 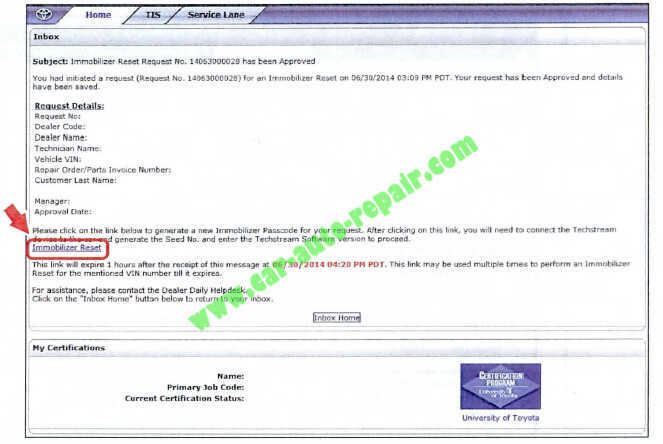 1.Once approved by management, the technician opens his TIS inbox and locates the Reset request. The technician clicks the title to open the Approval. 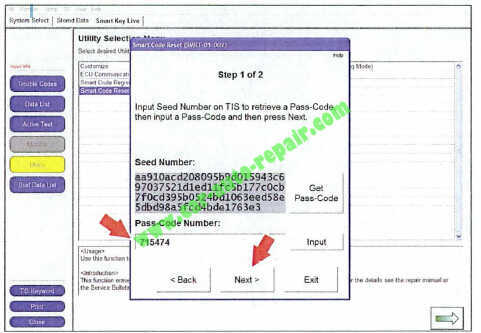 It is recommended to retrieve the Pass-Code from the Techstream connected to the vehicle as the Seed Number and Pass-Code work together.Once approved by management, multiple resets can be performed for a single VIN.Each attempt will create a new Seed Number and resultant Pass-Code. 2.Once opened, the technician clicks the Immobilizer Reset link to continue. 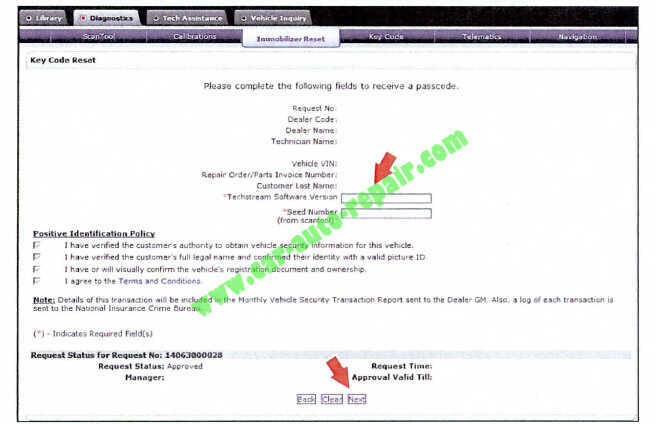 3.At this point, it is necessary for the technician to re-enter their password to login again. 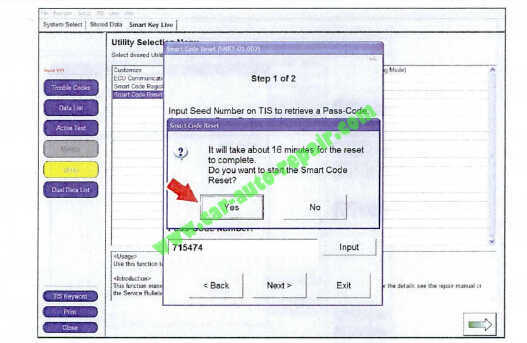 4.The technician must enter the Techstream software version and paste in the Seed Number from Techstream, then click Next. 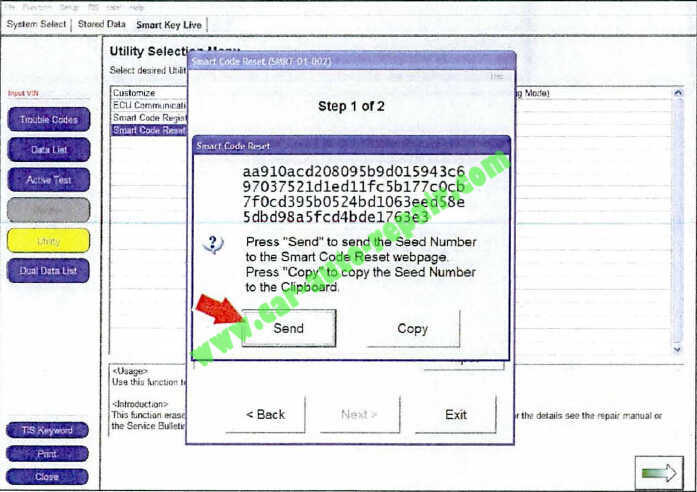 5.The Pass-Code will then be provided as shown. Continue to Section 6, “Techstream Reset Utility (Reset Initiated),” for instructions on entering the Pass-Code to initiate the Reset. inbox. 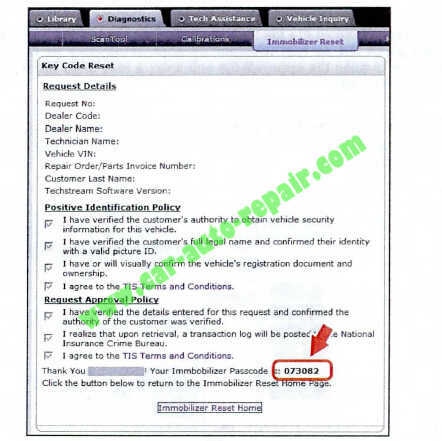 With this approval file, multiple Seed Numbers can be used for as many attempts as needed to repair the vehicle. 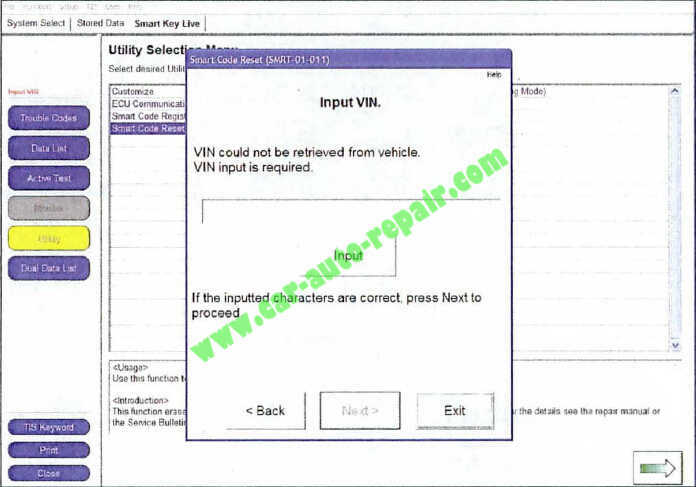 If you have received the file from management in your TIS in box that shows the approval status for the given VIN, do NOT resubmit for another approval for this vehicle. It will not be necessary.Continue to open the approval file and enter a new Seed Number to get the unique Pass-Code for each attempt. 1.After retrieving the Pass-Code from the manager approval process in Section 4 (“Manager Approval’) and Section 5 (“Receipt of Pass-Code”), enter the Pass-Code in Techstream and click Next. 2.Click Yes to start the process. 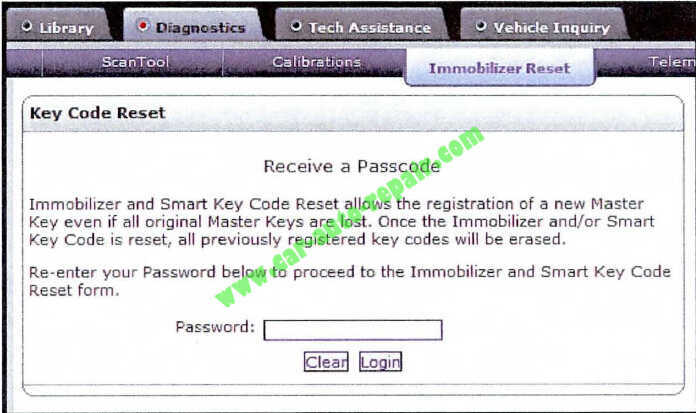 3.Once completed , it may be necessary to enter either the Immobilizer Key Registration or Smart Code Registration utility to program keys. Some early Immobilizer systems go directly into programming mode. This can be confirmed by the security light blinking a 2-digit code. Refer to the applicable Repair Manual for details.